Needle Felted Fairy Video Tutorial – Learn how to needle felt a fully jointed fairy doll with no wire armatures, no glass eyes, no clay parts – just needle felted wool. 9 hours of intense needle felting fun! Plenty of zoom-ins give you a nearly magnified view of the finest details! Without any high-speed sequences, the pace is relaxing, making it a magical learning experience as your unique Fairy Doll comes to life! 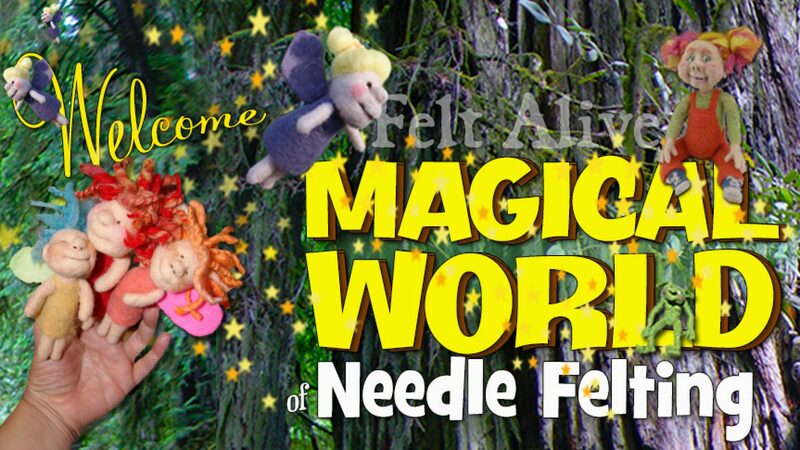 Needle Felted Fairy Video is my newest tutorial and I make it easier than ever for you to learn how to Felt Alive! Needle Felting is truly an amazing craft. It’s relaxing, meditative, therapeutic, peaceful, magical and a bit mysterious. In this 9 hour long tutorial, I do my best to take the mystery out as I teach you, step-by-step and poke-by-poke, the secrets of bringing wool to life. Needle felt the core structure using core wool batting – no wire armatures! Make flexible joints by connecting the core parts to create a strong and lifelike needle felted body. You’ll learn fun techniques to make needle felted hands and feet that add so much life to your character. Sculpt and form her little body using amazing yet simple techniques for creating a skin or flesh layer that rolls and stretches much like our own skin. Learn techniques for needle felting her slippers and suit using batting and prefelt. We spend several hours on faces so you’ll learn exactly how it’s done. Needle felted eyes and teeth are their own special magic! You’ll learn how simple it is to give your Fairy beautiful hair. Learn how to finish your project by filling in any holes left by the needles and taming down wool fuzzies. Finished FAIRY doll is approximately 8″ – 10″ tall. Muchas gracias por el vídeo! Muchos detalles muy buenos.